Answers from my mother and a always repeating pattern! Another evidence of that same phenomenon was happening at the backside of our backyard, I know and remember that I was extremely scared once I crossed a certain point in our backyard and then just started running like crazy towards the house. This morning I decided to ask my mother about these open questions. I asked her if she remember from the past what I was afraid of in both instances, why or from what i was scared from my closet and if she ever had a similar experience when she was younger and her answers are kind of confirming to me that there was more which I just cannot recall anymore. My mother also told me that she and her mother were living in an apartment that had a door man downstairs and they liked him a lot, he was always very nice. But then out of nowhere my mother started having this repeating dream of this man, they came into the house floor and saw the man but then out of nowhere the man would disappear and a white noise TV screen appeared which made my mother afraid and jerked her out of sleep every single time. If i had not read so much about other abductees stories I would say it was just a bad dream, but the way this dream was portrayed was smelling a lot like a VRS Virtual reality Screen dream, which is used to make the person think they dream this while they in reality are abducted without their knowing. Now I remembered after this that I also had two key dreams when I was very young. One of them was me standing in a dark mansion and suddenly there was this guy in black coat, with a top hat and no face. I got scared and ran away and every single time I would wake up in panic after this scene. The dream would repeat almost nightly! Another dream i had which is a key dream in these situations is that somebody gave me a black box and whenever I opened it and looked inside the box I got so scared that I woke up. These were nightmares without really having to be nightmares, I was scared without a reason of a black box and I did not even see the thing that was inside after opening it, all I remember is that I got scared and after that everything was black. No memory whatsoever what happened after that dream. Now the interesting part from today. I found this amazing page where a doctor interviewed a lot of abductees (mostly women) about their experiences, which could be retrieved with Regression hypnosis. the one thing most all of them had in common was that the Grays who were most reported, gave them in their experiences BLACK BOXES and whenever they looked inside their brain got flashed by terrible pictures of events happening or soon to be happening. Many of these women also got told what will happen to humanity and that they are the CHOSEN ones. Many females went through ova extraction and helped somehow creating hybrid races, children who look like children but are most part Alien in genetics. What is also very interesting is that all of these women who had abduction experiences or sightings the days after or preceding an abduction saw the sudden arrival of weird unnamed and unbranded black helicopters that were flying very low and always above her house. Now call me paranoid but since some time now during the day and also late in the night I hear them flying over our house as well! One day I was standing outside as I hear this extreme loud chopper noise and I look towards the sky and there were two black helicopters with open doors and Army men standing at these doors looking outside. I did not see from where they were coming and neither did I think anything weird about it, but the fact that ALL experiencers saw these helicopters on a daily basis and also had abductions with military personal tells me something is going on. If you want know more and see what I am talking about read these interviews about these women who all report one way or the other how their abductions came to their consciousness and how they lost time during just day to day work etc. And on top of that the marks and implants that resulted from these experiences. 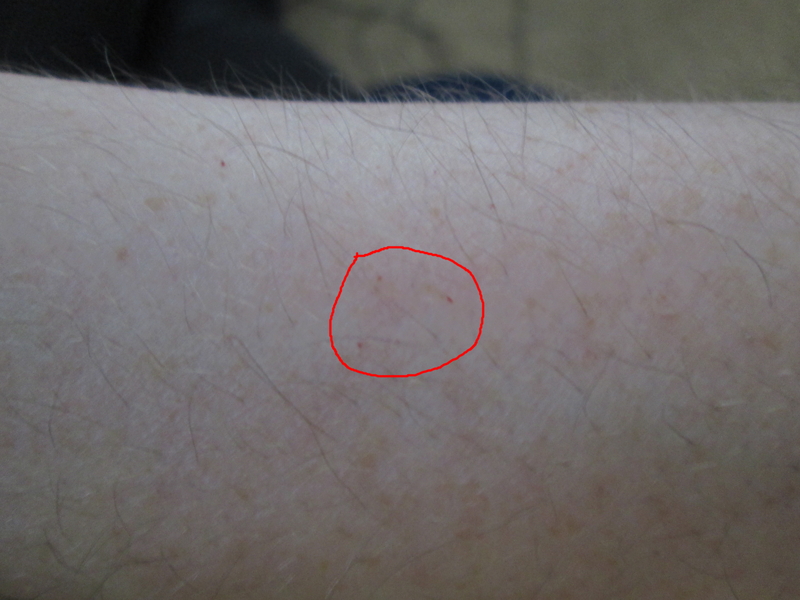 Scoop marks, sudden red dots on the skin that look like needle stings right after blood test was done, blue spots that look like you hurt yourself during the night? Or even unexplainable back pain and stiffness in the morning? All these are reported. Last night I had some very strong energetic experiences. I read a lot about the abduction theories and from other people who went through it and are still part of it. Supposedly they do not need to be present in physical form, they can work on the body in a weird metaphysical way. They change DNA and even implant through an etheric dimension. Which makes sense because none of the abductees ever saw a mark or wound that would suggest how an implant got into the skin! No scars, nothing. Why? Because they are there just not physical, they are working from another dimension and break down the metaphysical structure of the body and then work inside. We feel it as if it was physical! Back story, before I could hear these ear sounds and after my Awakening I was sitting at my computer working as I suddenly felt the air become very dense beside my left ear, I actually felt something entering my ear! The same happened a few times already with my nostrils, it’s like some kind of dense energy is entering my nose, which brought a lot of sneezing attacks with it. I know that something happened to me when I finally Awoke! I felt a lot of pulsing going on in my head last night, as well as my heart and legs. There was one moment when my head felt as if it was going to explode any moment and after that I felt a gentle touch on my forehead, it literally felt like something was stroking over my forehead! At the same moment my legs suddenly jerked up and the ringing in the ears was very clear and louder than usual. I have a feeling sooner or later I will put all the missing pieces together and then I will remember! At that moment my dream shifted and brought me to the next dream. In the next dream I was looking for another job this time it was inside a store that I actually know. I read about an interesting concept that Sprouts Farmers Market were working on and different stores had this idea to give customers some kind of ticket, whenever they would buy Rice Milk from the store! I remember that it was an amazing job, because all you had to do was stand as a cashier and whenever a customer bought Rice Milk I would give them a ticket for a free dinner at Sprouts! And I would earn money for giving the tickets away! I remember working at the store and giving tons of free tickets to all the customers who bought Rice Milk. And in the end of the dream I remember seeing the huge backside of the store were all the amazing food for dinner was stored and everybody who got a ticket got a free dinner! It was an amazing dream and totally in contrast to the one from before.